Shaheed Rajguru College of Applied Sciences for Women, University of Delhi is selected as one of the participating institutions under Unnat Bharat Abhiyan (UBA), a flagship program of MHRD, Govt of India through a challenge mode application. The mission of UBA is to engage the faculty & students of higher educational institutions (HEI) in improving the social and economic well being of the rural communities. The knowledge base and the resources of the premier institutions of the country are to be leveraged to bring in transformational change in the rural development process. It also aims to create a vibrant relationship between the society and the HEI, with the later providing the knowledge and technology support to improve the livelihoods in rural areas and to upgrade the capabilities of both the public and private organizations in the society. 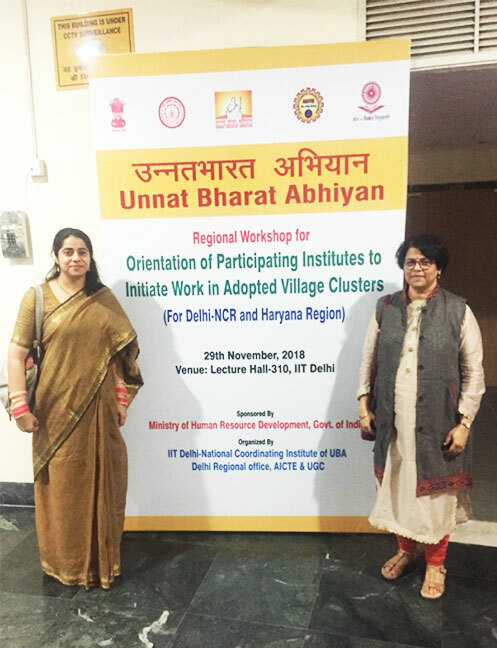 Dr Ranjana Singh & Ms Prabhjot Sabharwal as co-ordinators of this program at SRCASW, attended the orientation program of UBA on 29th Nov. 2018 at IIT Delhi which is identified as National Co-ordinating Institute.